1. Return: That part of fabric which covers the area from the end of a curtain rod back to the wall. Clearance: Rod clearance is the distance from the wall to the back of the rod; not to be confused with returns. 2. Rod pocket: Generally refers to pocket depths of 2 1/2 inches or less and is designed to use a standard curtain rod. 4-5. Continental: The term continental has come to be synonymous with the wide rod-pocket curtains or valances. Continental I and Continental II are registered trade names for Kirsch curtain rods 4 1/2 and 2 1/2 inches in depth respectively. 6. Headers or Heading: The top part of draperies that accommodates the pleating. 7. Headers: In curtains other than pinch pleated, the header is that portion of fabric above the rod-pocket. 8. Undertreatment: In layered window treatments usually the covering nearer the glass, frequently sheer panels. 9. 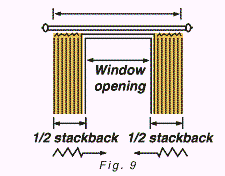 Stackback: The amount of space a drapery occupies when drawn open. 10. Stackside: The side of a window that draperies will be drawn toward. 11. Shirr or shirr-on: Refers to a gathering of a flat piece of fabric onto a curtain rod. 12. Panel: A panel is one piece of fabric, either flat or pleated. 13. Pair: A pair is two panels of equal width and length. 14. 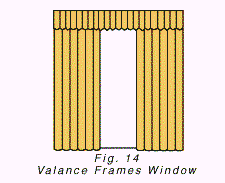 Valance: A top treatment that frames a window. 15. Swag, verb: To draw over to one side. 16. Swag, noun: A top treatment with a right treatment with a right and left side which frames a window and extends down the sides. 17. Tier: Short rod-pocket curtains, sold in pairs, designed to be layered one row above another or to be used with valances and swags. Curtain (not shown): Refers to rod-pocket-top styles designed to be shirred onto a curtain rod. Drapery (not shown): Generally refers to pinch-pleated-top window coverings but not exclusively. A drapery is made of heavier fabrics than curtains and is often lined. Satins and Jacquards: Usually the most formal and traditional, they are generally made from tightly woven, heavy, soft material which hangs straight from top to bottom in (formal) folds. Casements, Open Weaves: These have a lighter, more casual feel. They are usually made from loosely woven, textured yarns that hang in looser folds than the formal satins and Jacquards. Sheers: Made of soft, see-through fabrics, sheers are appropriate in most decors. Light and airy, they are sometimes used in combination with heavier draperies in more formal settings. They are billowy unless weighted, and can be made to drape quite well. Prints: Suitable in most decors, prints are made from light, tightly woven fabric, usually cotton or cotton-polyester blends. Drapery Linings: Linings add substantially to the luxurious appearance necessary for good window treatments, and also provide a fuller pleated look for maintaining a soft drapable hand. The lined-look provides uniformity to the exterior appearance of a home while allowing a broad choice of textures, weaves, colors and patterns for the interior. The combination of sunlight and air pollution will eventually take its toll on all colors. There is no such thing as an absolutely colorfast material or dye. Some colors, however will show fading more dramatically than others. Bright colors tend to show fading more than subdued tones, and solids before prints. Linings help draperies last longer. They afford some protection against sun and fading. They also protect the draperies from water stains - either from condensation on the inside of the window or from a sudden shower. Insulated linings contribute to energy conservation, keeping homes cooler in summer and warmer in winter.